…well, not quite. but research centers should look into this cause seriously, frozen peas seem to remedy all sorts of things: icing sprained ankles (been there many a time), making a batch of soup when you are sick, and of course, keeping your thermostat cold. when i looked up in Fumiko and Jorge’s hallway last night as i was leaving, i saw this and was completely bewildered. i initially thought that it was an art project of sorts (must be an artist’s political statement, duh). we all looked at each other with confused looks on our faces, until Fumiko figured out that it was there to keep the thermostat cold, so the heat never stops generating. A-HA! GENIUS! once again, that inconspicuous bag of frozen peas you bought 2 years ago saves the day– keeping us warm during the cold winter months. frozen peas, we salute you. UPDATE: i was just talking to my co-worker, Dawn, who told me that SHE and her boyfriend Karl practically INVENTED this ingenius pea trick to cool down the thermostat. 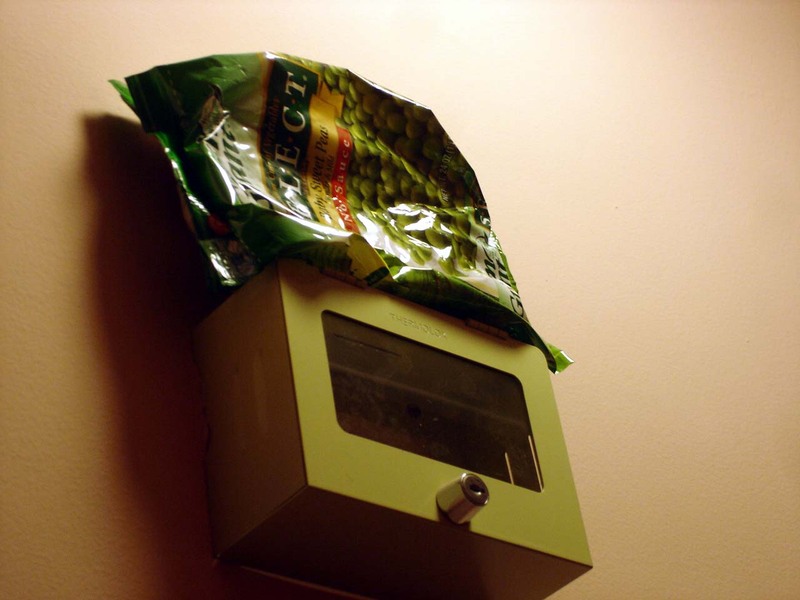 turns out that she is good friends with people who live in Fumiko’s building, and she told them about this- hence, there were frozen peas on the thermostat last night. isn’t it a small world??? This entry was posted on March 20, 2007 at 12:23 pm and is filed under *Kayoko, tech, Veggies. You can follow any responses to this entry through the RSS 2.0 feed. You can leave a response, or trackback from your own site. I have to show this to my elderly downstairs neighbor–she’s always balancing a ziploc of ice on our thermostat. This looks far less unwieldy. Green pea’s in da house! – … you think they’re kyoto-correct? – well they sure contribute to the local warming! That’s why I love my building!! !